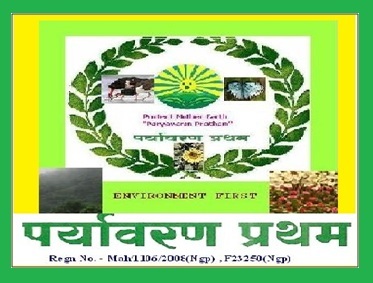 ‘Paryavaran Pratham’ – The committed group of environment & nature lovers, interested in doing social activities to create awareness & build capacities about the Environment, Health, Safety n Disaster management issues for sustainable development of the society and for our mother: Planet Earth. ‘Paryavaran Pratham’ came into existence on 6th December 2008. It is registered under the Bombay Public Trust Act and Societies Registration Act. Our aim is to ease the ‘Knowledge Brokerage’ in the society and community. Knowledge brokering is about bringing the people together, to help them build relationships, uncover needs, and share ideas and evidence that will let them do their jobs better for the ultimate benefit of the society. Knowledge brokerage for Climate Change & tackling Global Warming is important because the knowledge about this phenomenon is complex, diverse and contested; there is a urgent need for the development of practical plans and strategies that can be agreed and implemented by organizations, governments and communities. Consensus building across how to address climate change impacts and risks, what mitigation and adaptation approaches to use, and how to engage a diversity of stakeholders, practices, and capacity in the management of knowledge. Donations and other kind of help will be thankfully accepted.